Welcome to the world of saving and sharing seed! The seeds you borrow from our library are lent to you at no financial cost, and yet they are priceless! A commitment to growing plants for seed is a gift to yourself and your family. We hope you learn much, experience the joys of gardening, and enjoy the fruits of your labor. At harvest time, please take some steps to save seeds for others. We ask that a portion of your seeds from the strongest, tastiest, and most vigorous plants be returned to The Seed Library to keep the library self-sustaining. The more seed we have in our library, the greater the number of people in our community who will be able to experience the joys of growing their own food. 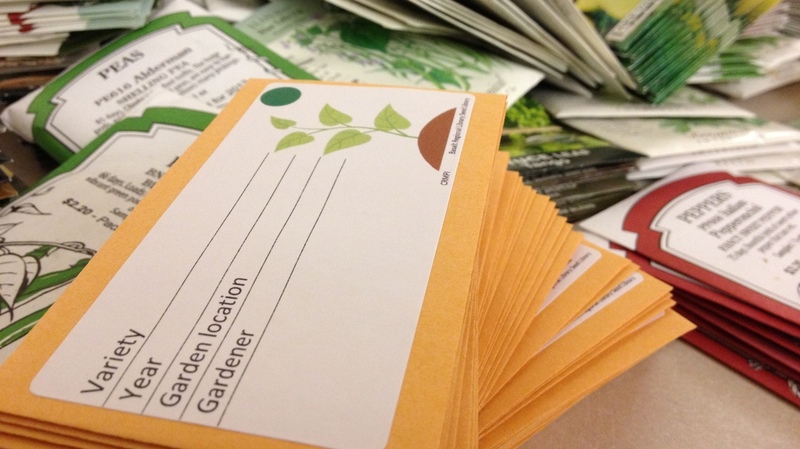 A seed library is a place in your community where you can get non-GMO heirloom quality seeds for you to plant at home. People have been saving seed for more than 12,000 years! However, in our culture, much seed-saving knowledge, along with significant biodiversity, has been lost over the last hundred years. Seed saving is important for so many reasons, including cost efficiency, improving the quality of seeds acclimated to that climate, improve pest resistance naturally, increasing genetic diversity, self-sufficient food supply, and sharing the knowledge and culture of seed saving.